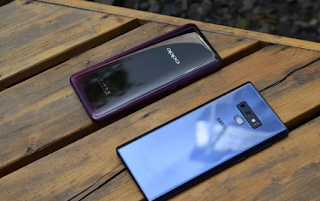 I am not trying to pass a verdict just yet, but should we consider this comparison a fierce battle between the Samsung galaxy note9 and the Oppo Find X? Well, not everyone would trade the opportunity of owning a Samsung for Oppo. I haven't laid hands on devices just yet but someone I can trust his review have done that. Lets see what Saruni Maina of techweez has to say about both devices. The truth is, in terms of design I will pick the OPPO Find X over the Note9 because it looks way better and more beautiful. That edge-to-edge display is a marvel to look at, makes the Note9’s infinity display look like a house of bezels. Both devices are made of glass on the front and back, so don’t go showing love to the floors with either but things get especially fragile with the Find X thanks to its retracting camera mechanism. Hiding the cameras underneath the body and only pulling them out when required, gave the Find X an edge (pun intended) over the Note9 when it comes to the screen-to-body ratio. However, this came at a cost; this moving part could easily break and presents a whole lot of complications that most people are not willing to bare.The back of these two phones are one to get easily scratched thanks to the materials used, so it would be recommended to have a case on either but this then takes away from the beauty, especially on the Find X that has a beautiful gradient colour. When it comes to the display and away from how far the display gets close to the edges, we’re just pleased that neither of these phones has a notch. The Note9 does have a higher quality display though, one that churns out more pixels at 2k resolution and gets way brighter compared to the 1080p display on the Find X. The colours on the Note9 are more pleasing, in general, the Find X might have the looks in terms of design but the Note9 carries the trophy with its beautiful display. Note9-vs-FindX-(5)Here again, the two lock horns. On paper, the OPPO Find X looks like one to wipe the floor with the Note9 but in reality, the Note9 does a much better job at photography. The Find X boasts of a dual camera setup of 16MP and 20MP while the Note9 carries two 12MP lenses. On the front, the Find X packs a gigantic 25MP lens that actually gives the Note9’s 8MP lens a run for its money. Without diving too much into the details, the images produced by the Note9 look far much better than the ones of the Find X. In broad daylight, they both shine, with proper details. At night, the Find X would also struggle a bit with colour accuracy and noise. As for selfie, well… the OPPO just has something about it, also, the portrait shots are a bit harder to differentiate but I like the ones taken on the Note9. The Find X comes with 8GB RAM and 128GB of internal storage, the Note9 has 6GB RAM and 128GB storage as standard. That 8GB RAM on the Find X sounds like a beast but somehow, there were stutters and lags once in a while, something that I can attribute to the software, I also noticed the Note9 having issues with Instagram.Both devices have powerful processors, with the Find X getting powered by the Snapdragon 845 and the Note9 an Exynos 9810. There’s really no big difference between these two processors, however, benchmark scores place the Find X ahead of the Note9 – I don’t have screenshots, you’re just going to have to take my word for it. As for the battery, the Note9 has a larger capacity at 4000mAh while the Find X stands at 3730mAh. The difference between these two in real life is negligible, both devices manage to last throughout a day of heavy usage with an average screen-on-time of over seven hours. When it comes to charging up, the Find X is significantly faster, charging from zero to a hundred in around an hour, thanks to VOOC Flash charge, while the Note9 requires an additional 30 minutes to fill up, which is still fast. Now here’s where you either get value for money or end up feeling like you were shortchanged. Whilst the Find X offers nothing more than a beautiful design and the already mentioned specs, the Note9 bundled everything it could into its body. Wireless charging, IP68 water resistance, loud stereo speakers, a functional stylus and even ability to turn your phone into a desktop by connecting it to a monitor – all features missing on the Find X.